Tips and techniques for defending the high post within the Pressure Man-To-Man concept. Most often when an offensive player is deployed in the high post area, they will assume primarily a screening or passing role (UCLA cuts, Pinch Post, for example). Still, keeping the ball out of the high post is a priority. By using the phases of this 1-on-1 high post drill, we’ll explore tips and techniques for defending the high post. 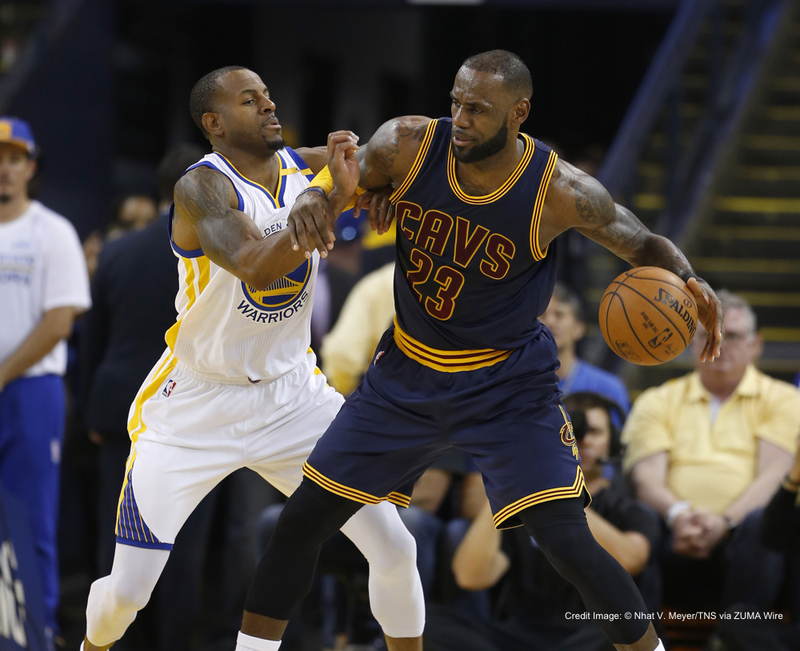 While defending a high post player, the defensive player should assume a pass denial position on the side of the ball (“ear on chest”denial position). The denial arm in the passing lane shows the “stop sign” to the passer. Keep your ear on the chest of the offensive player without getting so high as to provoke the lob over the top. Maintain your feet by “bracketing” the high post’s foot that is closest to the midline, do not get hooked. Move when the ball moves. When changing sides, the defensive player should move behind to prevent the high post from roll cutting to the rim for an easy shot. 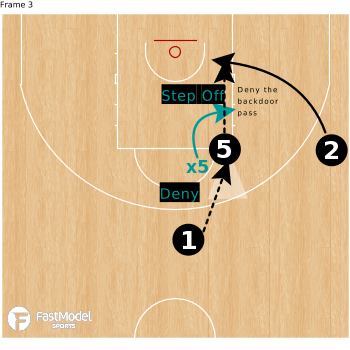 The differs from the movement in defending the low post where the defender x-steps in front. When defending the high post, the defensive player should always be aware of the over the top lob pass. 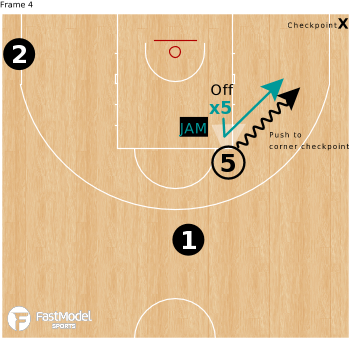 In many offenses (Princeton, 1-4, Triangle, Elbow Series) the objective is to enter the high post then cut a player from the wing behind for a back door cut. After the catch, the high post may not even face the basket to deliver the pass. 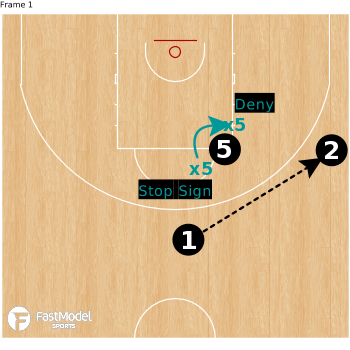 Instead, they smoothly deliver a bounce pass to the cutter while facing the halfcourt line. If/when the high post receives the ball with their back to the basket, the defensive player should step off (arms length) and play the passing lane attempting to disrupt the back cut. 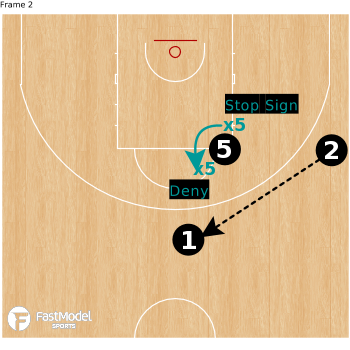 If they do not face up, step off, assume pass and play the passing lane to the back door cut. They are not shooting if they are not facing the basket! Facing up means the elbow/high post shot is on the menu. If/when the high post turns and faces the basket, the defensive player should immediately step up and JAM. Make the player, often a post player, a dribbler. If the high post puts the ball on the floor, the defensive player forces to the corner checkpoint. You will face high post offenses when using a pressure man-to-man system. Opposing coaches will see that your team is denying and extending and think to “lift the defense” and play behind you. Do not be dissuaded. Use these tips to keep the ball out of the high post, disrupt passes when it does enter and make high post players dribble to an unwanted shot once they face the basket.